Live at Boston Music Hall, Boston, MA. USA 14th November 1974. Bowie in 1974, meeting her ally Carlos Armor and approaching soul music quickly. The legendary name Taper of that moment: John Mallonie recorded the best marks recorded by permanent preservation press 2CD. What is engraved on such a work is “Boston Performance November 14, 1974”. This week, the same 1974 Maloney recording “BOSTON JULY 1974: JOE MALONEY MASTER (Wardour-283)” will also be released at the same time, but in a separate show as per the title, this work is a November recording about 4 months later. Not only the date but also the tour is actually different. First of all, let’s check what position this show’s show is in the course of 1974. 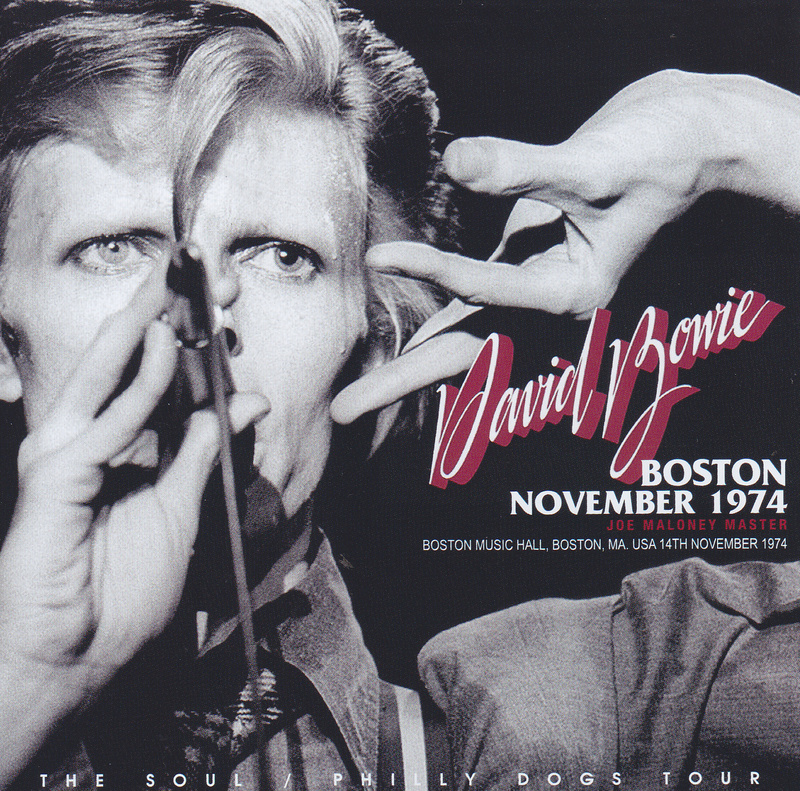 Bowie who announced “DIAMOND DOGS” divides it into three parts in the whole country, among which “BOSTON JULY 1974” and the official board “DAVID LIVE” was the earliest “North America # 1” live album. In contrast, the Boston performance of this work is a concert that is the 25th show of “North America # 3”. This “North America # 3” is also called “THE SOUL / PHILLY DOGS TOUR”, and it has changed to “North America # 1 & 2”. In addition to showing new songs of “YOUNG AMERICANS” that started production, we introduced a lot of arrangements that are conscious of soul music. Members are also different, in addition to the above-mentioned Carlos, the rhythm team has been replaced by Willie Weeks and Dennis Davis. In the back vocal also “YOUNG AMERICANS” members participated in the majority such as lovers of those days lovers Ava · Cherry, Robin · Clarke, Luther · Vandross etc. It is facing a large household of 14 people in all. 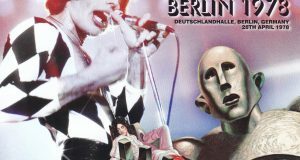 Although it is “THE SOUL TOUR” that became the very turning point, this work is the best elegant live album for that work experience. Just like “BOSTON JULY 1974” it is woken up by the master of legendary mastery Marooni, again the highest peak selected by overseas Bowie researcher. The best thing is clearness that shines like a crystal glass. It is not a type that is wrong with a sound board and it is not without distance. However, the air feeling is transparent in any way, it is transparent, and it can not feel muddiness or muffle at all. Carlos & Earlsick’s guitar penetrates straight through the space and the singing voice of the Bowie reaches strong despite the presence of six backing vocals. At this time there is also a masterpiece of press CD “PHILADELPHIA 1974 (Wardour – 234)”, but this work is much longer than that, and you can enjoy it firmly from “Memory Of A Free Festival” telling the performance. The recording itself is a valuable “THE SOUL TOUR”, it is a name recording suitable for becoming the representative. The show drawn with that sound is a big attention. 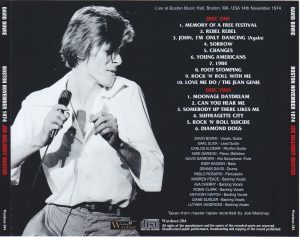 While the set is based on “DIAMOND DOGS TOUR”, new songs of “YOUNG AMERICANS” “Can You Hear Me”, “Young Americans”, “Somebody Up There Likes Me” were picked up and furthermore “Sorrow” of “Pin Ups” John, I’m Only Dancing (Again) “, THE FLARES cover” Footstompin ‘”also introduced. It is the first time that I have been reborn. 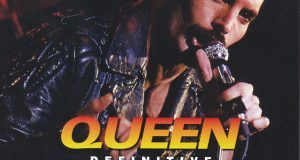 Both “John, I’m Only Dancing (Again)” and “1984” will fight with a funky rhythm and “Rock ‘n’ Roll With Me”, “You You Hear Me”, “Somebody Up There Likes Me” Arrange unique this time. It feels plenty of darkness and calm flow, cover and self-made songs let you hear boldly violent bastie. 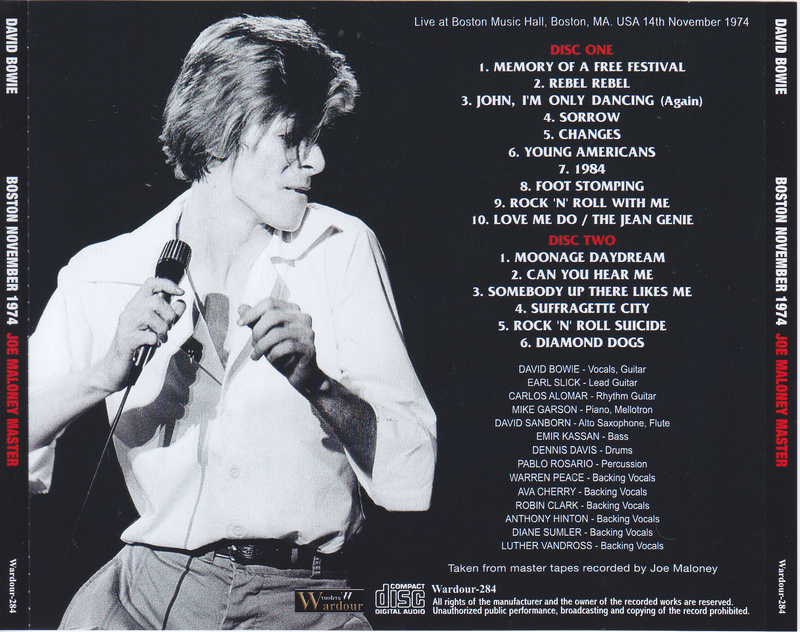 This release is “BOSTON JULY 1974: JOE MALONEY MASTER” which will be released at the same time. Although each is a superb item that represents the tour, it is also a sister work that you want to enjoy together. In 1974 the same Boston Music Hall, and also superb sound by Maloney Master. While all these conditions are complete, it shows a different expression. 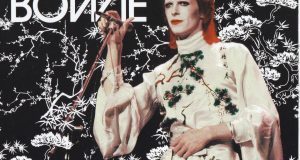 Although it is a bowie that changed like a chameleon, in 1974 it was just a turning point. It is a valuable sister work that can observe that fixed point with the rare superior quality in-situ sensation of that moment. Please, please experience with permanent preservation press 2CD.